When you book an appliance service technician, you expect your appliance to be repaired promptly. At Appliance Maritimes, our manufacturer-trained technicians are dedicated to providing 100% satisfaction. We guarantee an accurate diagnosis of your service problem – the first time around. All Appliance Maritimes service technicians receive annual training from top-tier manufacturers. Our technicians have the knowledge, training, experience, and expertise to service and repair your residential and commercial appliances accurately and efficiently. At Appliance Maritimes, our policies and prices are simple and straightforward — no hidden charges. We use only new, factory authorized parts to put your appliance back into working condition. We’ll provide you with a fair and accurate estimate, and will only begin repairs after we have received your approval. All of our appliance and air conditioning repairs come with a 30 day labour warranty and a 90 day manufacturer’s warranty on all supplied parts. We provide Manufacturer’s Warranty repair work for most major brands including Electrolux, Frigidaire, General Electric, KitchenAid, LG, Maytag, Samsung, and Whirlpool. We also provide non-warranty repair to ALL BRANDS! For a residential service call our trip and diagnostic rate is $74.95 ($69.95 with coupon!) Repairs will be based on a flat rate billing system. For major appliance repairs for commercial and multi-tenant buildings, condominium complex, hotel and residences, please call us for a customized repair call rate quote. 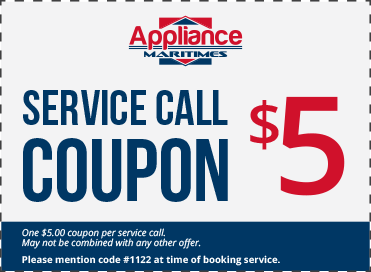 We offer a $5 service call coupon! Receive a $5 discount when you mention coupon #1122.